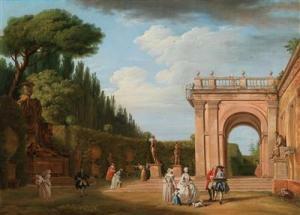 Find artworks, auction results, sale prices and pictures of Joseph Claude Vernet at auctions worldwide. A MEDITERRANEAN PORT AT SUNSET, WITH A FISHERMAN IN THE FOREGROUND AND A COUPLE AT LEFT WALKING ALONG THE ROCKY COAST Claude-Joseph Vernet AVIGNON 1714 - 1789 PARIS signed and dated lower right:J.Vernet / 1778 oil on copper 15 3/8 by 21 5/8 in. ; 39 by 54.9 cm. Provenance Anonymous sale, Paris, Piasa, 28 June 2000, lot 21; With Richard Green, London; There acquired by the present collector in October 2000. This remarkably preserved view of a port at sunsetis a mature work by Claude-Joseph Vernet,arguably the most famous view painter of the second half of the eighteenthcentury. Both its pristine condition and smooth copper surface make the soft and subtle light of the setting sun glistening in the soft Meditteranean waves as moving today as it would have been the day Vernet painted it. InA Mediterranean Port at Sunset,Vernet's marvelous ability to capture the nuances of light and atmosphereand his use of the smooth surface of a copper support create an evocative and impressive portrait of an unknown yet familiar port, probably somewhere in southern Italy. Surprisingly, it isone of only a few paintings on copper by the artist, for it would seem that the even, nonabsorbent surface would be perfectly suited tohis refined technique, butthe vast majority of his paintings are on canvas.The choice of support may have had more to do with monetary rather than aesthetic considerations, formost of Vernet's paintings were commissions and copper was far more expensive than canvas.A Mediterranean Harboris, in fact, quite large for a copper and would have been verycostly indeed. Signed and dated 1778,the painting dates from Vernet's maturity,whenthe artist had been the foremost painter of marine subjects in France for more thanthree decades. He had learned his trade in Italy and it was probably through an association withAdrian Manglard in Rome, where he arrived in 1734, that Vernet first turned to marine painting. He remained and worked in Rome until 1753, when he was summoned back to France on the initiative of the Marquis de Marigny, in order to fulfill one of the most important commissions of the reign of Louis XV: the representation of the Ports de France, a project he continued to work on until 1765 and included expansive views of all of France's major commercial and miliary seaports. Vernet's style changed little throughout his career and some of his finest works date from his late maturity; see, for example, the enormous canvas (160 by 261 cm) commissioned by William Petty, 2nd Earl Shelburne and executed in 1776 at the age of 62.1 1. 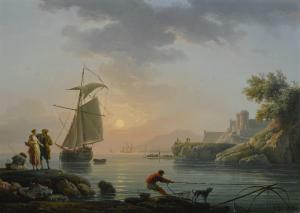 Sold at Sotheby's New York,27 January 2011, lot 183, forover $7,000,000. 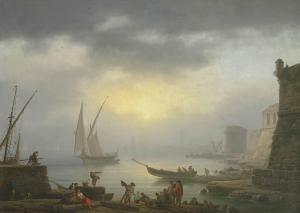 Claude Joseph Vernet (Paris 1714-1789) A harbour at sunrise signed, inscribed and dated 'Joseph·Vernet·f· / Roma·1747' (lower left) oil on canvas 39 ½ x 54 ¼ in. (100.4 x 137.8 cm.) Provenance Commissioned in February 1745 by William Drake (1723-1796), later M.P., and by descent at Shardeloes, Buckinghamshire to the following, Captain Thomas Tyrwhitt-Drake (1783-1852); The Tyrwhitt-Drake Settlement; Christie\’s, London, 25 July 1952, lot 158, as a pair with A Rocky River Scene (800 gns. 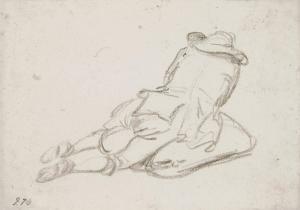 to Agnews, with lot 157, a second pair of Vernets). with Thomas Agnew & Sons, London, where acquired by the following, Sir Brian Mc Grath (1925-2016), and by inheritance to the present owner. Claude Joseph Vernet (Avignon 1714-1789 Paris) A cove on a rocky Mediterranean coast, with small vessels and fishermen signed and dated 'Joseph Vernet/f. Romae/ 1747' (lower right) oil on canvas 32 x 49.5cm (12 5/8 x 19 1/2in). Footnotes Provenance The Earls of Bessborough, Stanstead Park, Sussex (according to a label on the reverse) Sale, Sotheby's, London, 10 April 2003, lot 100 The attribution to Vernet was endorsed by Dr. Philip Conisbee at the time of the last sale. The architecture in the present work bears a resemblance to the Villa Costaguti (now Borghese) in Anzio.